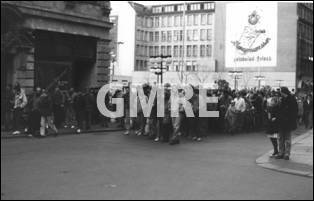 On January 15, 1989, about 500 people gathered at the Leipzig market place to demonstrate for basic democratic rights. 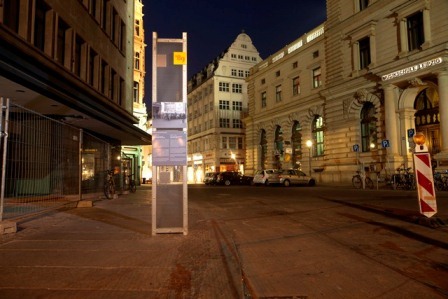 After a short speech, they moved down Petersstraße in the direction of the birthplace of Karl Liebknecht, who exactly 70 years earlier had been murdered together with Rosa Luxemburg. Not until it was outside the city centre did the police dissolve the unauthorized demonstration and arrest 53 participants. For the demonstration members of opposition groups in Leipzig had distributed some 4,000 leaflets through various methods including stuffing mail boxes in the city on January 11, 1989. The State Security arrested the initiators, threatening them with long prison terms. Because of GDR-wide and international protests, the SED leadership found itself forced to release the detainees after a few days. On January 15, 1989, citizens who were for the most part not organized in opposition groups had for the first time participated in an unauthorized demonstration.